The Landmark Series® 32 gallon trash container and lid combo is constructed of light duty, commercial grade, 100% recyclable plastic for strength and durability. Sturdy injection molding is UV protectant and resists scratching and dents. Ideal for any indoor and covered outdoor use such as at gas stations or park shelters. Standard bolt-down base ensures stability. Access opening height is compliant with ADA regulations. 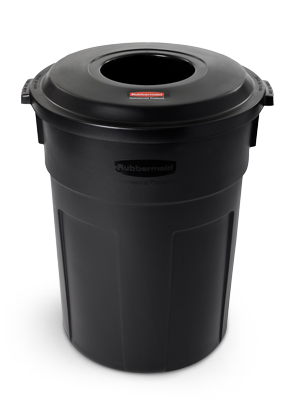 Funnel style lid is perfect for touchless refuse disposal. Lid measures 22-1/4"Dia. x 2-3/4"H and also fits 32-gallon BRUTE® containers. Lid and base may be purchased separately.